The goal for this project was to develop, working closely with Marsh LLC, an affordable 1-bed 1-bath ADU that optimized the City of Portland’s special rules governing ADU’s less than 15 feet in height and 24 ft x 24ft in plan. Structures of this size can be located within the side and rear setbacks and don’t need to match the design of the main house, which open up a lot of options for homeowners. Like all of the projects in which retain an equity stake, the rent for this ADU was set according to the City’s Affordable Housing Standard. This unit was built on property that we own, and the primary objective was to explore cost-efficient construction techniques that we could apply on future projects. There is only one interior demising wall and a closet. The entire roof is storage trusses with concealed ladder access from the great room (a window opens into the attic to allow for loading of large items directly from the driveway outside the unit). High ceilings, large window openings and a neutral material palette keeps the space feeling light and open. The project included a separate laundry room (the orange door that opens into the backyard) for shared use with the primary residence on the property. Despite our best efforts ths cost/square foot for this unit is the highest of any project we’ve built to date. We have identified two main reasons. The first is the flooring. We elected to spend more than $3,000 on a premium flooring tile set on a herringbone pattern. If we had wanted to save more money we could have just stained the concrete slab on grade. 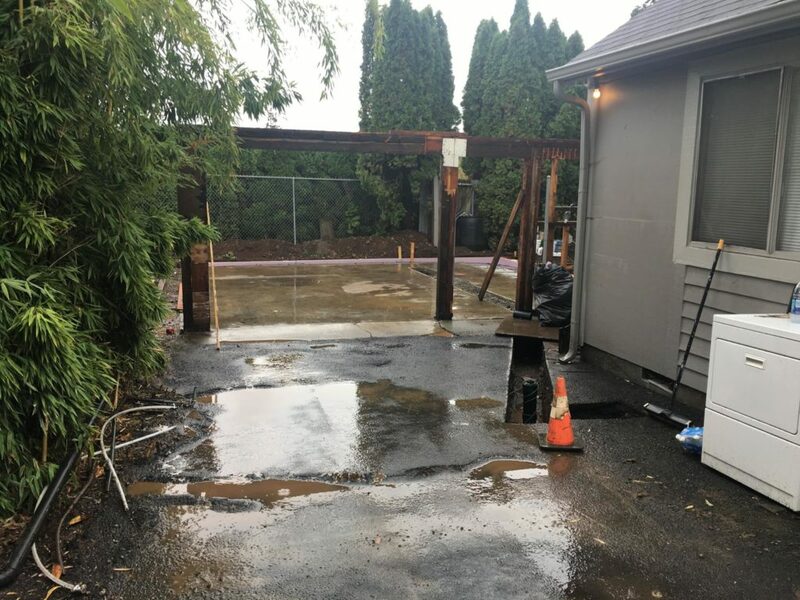 The second reason is that there was an existing structure on the site that we couldn’t reuse and that required us to do over $5,000 in demolition to get to a single portal frame and a concrete slab before we could begin. And while our foundation costs would have been higher on an empty site, since two edges of the slab were re-formed anyway the additional cost would have been minimal. This same project as new construction, with a stained concrete slab-on-grade floor would probably have cost at least $5,000 less and brought the cost closer to $110/sf. Assumed electricity use: $98/month (from the 2015 HUD Utility Allowances for Portland). We are excited to apply the lessons learned on this project to future construction projects and think we have demonstrated the ability to provide 1 bedroom units under the $70k price point. If this sounds like something you would be interested in please contact us and see what we can do for your next project!